A hibachi grill essential, this Garland electric drop in Teppanyaki griddle will prepare delicious fish, chicken and shrimp for years to come. 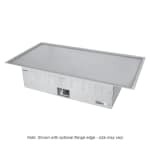 The stainless steel front panels and black powder coat epoxy sides of this drop in Teppanyaki griddle are easy to clean and look stylish in any venue. The 11" x 34" heated cooking zone evenly cooks even delicate foods. Because this is a drop in Teppanyaki griddle it can easily be used for entertainment or demonstration cooking. Earn repeat business with talented chefs, delicious food, and putting on the best in 47-5/8" Teppanyaki griddles in your restaurant!